I kept eyeing this candle on Olfactif's website and when it went from $48 to $38 I knew I was hopeless on holding out any longer. 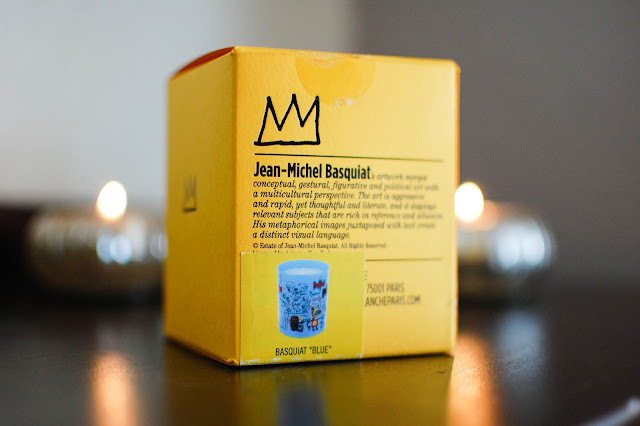 This Basquiat Blue Amber-Woods candle is 140 grams with a 40 hour burn time. It touts glass from Ligne Blanch Paris, Givaudan fragrance and artwork from Jean-Michel Basquiat. The notes are deceptively simple: amber and woods. However, it is much more lush and full bodied than it seems. When I opened the box and looked into the candle I was surprised to see little wood fibers suspended in the paraffin wax. Once lit the wick held strongly and burned steadfast and slow. The wax pooled to the edges after about an hour of burn time. 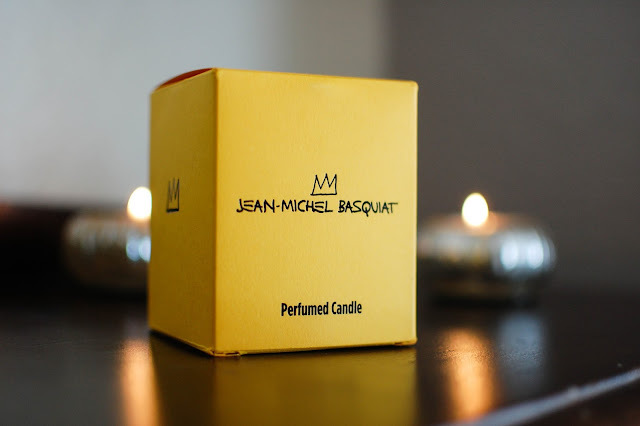 The scent throws medium-strong on my nightstand in the bedroom. And that scent. So eyerollingly good. Sleek drops of golden resinous amber, smooth like suede and brimming with blonde woods and white musk, this candle smells like an elfin queen's intimate bedroom bower, overflowing with sophistication and elegance under the light of a full Hunter's Moon. The glass is semi-transparent and etched with the stark and energetic art of Jean-Michel Baquiat. I will be saving this glass holder long after the plush amber woods scented wax is long gone. There are two other candles that caught my eye as well... a mint one and a cinnamon caramel one. I may have to revisit Olfactif soon. 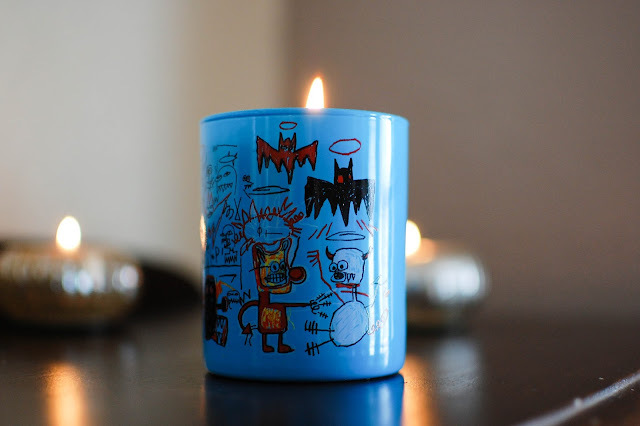 Plus I really would love another Laudano Nero candle to cherish. Do you have any candles burning by your bedside or in your home? Your sentiments are so beautiful, Ellisa! You go and burn that baguette. The time to celebrate is NOW! Like you said. 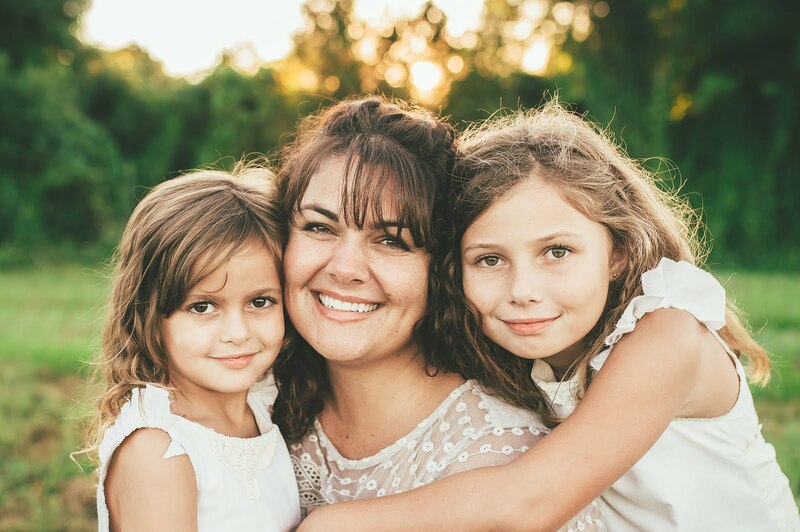 A healthy happy family is a huge thing to celebrate. I love using up my perfume samples. Sometimes I will drain a whole one and walk with a sillage like a tsunami and enjoy the fragrance wafting around me even if that is the only time I will ever get to wear it. I hope you enjoy dipping into your samples and wearing them with abandon. <3 Have a beautiful day my beautiful friend! Now this is something you do not see every day. Prints of priceless art on a candle. Is this a likeness of the one that sold for hundreds of millions? I'm not sure how I feel about the dichotomy of one of a kind works produced massively, but I AM absolutely intrigued. Not to mention that scent description. 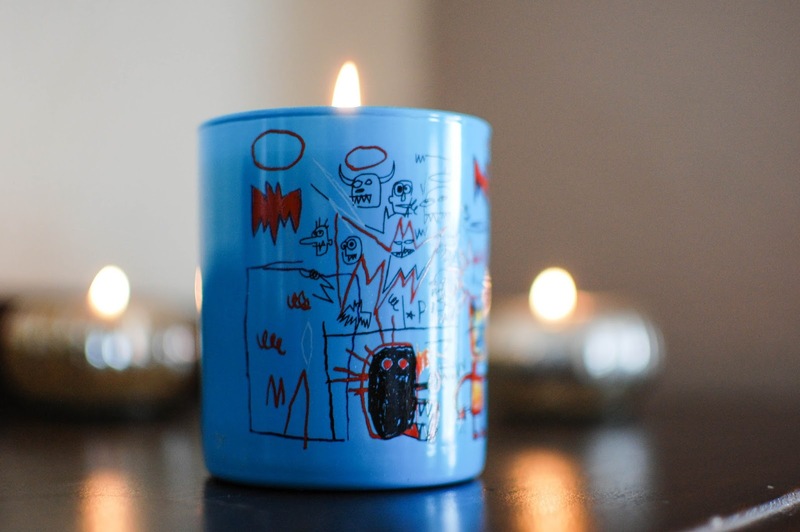 Yes, this is from a series of candles portraying the artwork of Jean-Michel Basquiat and Keith Haring. I understand your hesitation. I do enjoy artwork but not being able to afford prints it is nice to have beauty and art gracing my home in ways I can manage. Plus if the artist or his trust did not want his images used in this manner I am sure they would not have allowed it. The scent makes me float up to a happy place. I am thinking you may enjoy it! If you like perfumy more refined ambers I think you would. Not going to lie...I have never heard of this brand and when I first glanced at the photo I thought one of your girls did the drawing on the outside lol. That scent description though! Sounds like my idea of heaven. Basically with me, if it has the word "wood" in the description I know I'm gonna like it. I'm definitely true to my Virgo earth sign when it comes to scents. Thank you for yet another great review! Too funny! It is a bit raw. But I am loving it. Edgy and primal. Which makes for an interesting juxtaposition with the scent which is refined and elegant. I am right there with you on the love of woods. I am inexplicably drawn to them. Thank you for stopping by Renee! 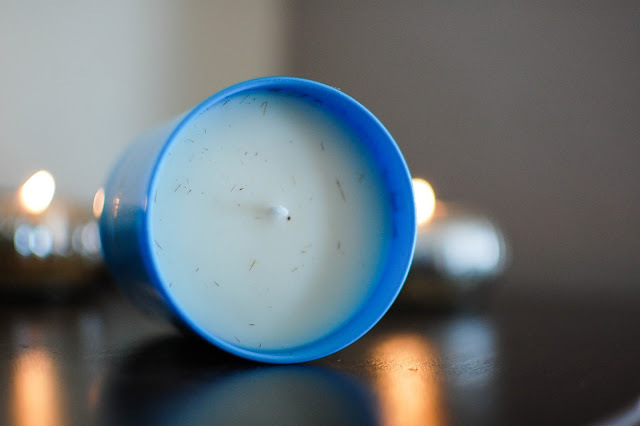 I am planning on trying a couple more of these candles. I just love them.